Nursing home abuse takes many forms, and it is important for family members to have a comprehensive overview of this societal issue before enrolling loved ones in a facility. Knowing how abuse occurs, the legal rights of loved ones and how to report abuse can empower family members to take action if it is ever necessary in an abusive situation. First off, nursing home abuse can occur in the physical, mental, verbal or sexual forms. Nursing home neglect also can impact residents, and it refers to a lack of adequate care that causes harm in the lives of nursing home residents. Residents can develop bedsores or ulcers due to a lack of movement, improper transitions or improperly trained staff. Throughout the year, Medicare routinely gathers data on the 102 nursing homes rated in Utah through surveys, inspections and investigations into formally filed complaints. The federal agency states that currently, twenty-two (22%) of these nursing homes are deemed to provide substandard care based on identified violations and deficiencies. Was your loved one injured, mistreated, abused or did they die unexpectedly from neglect while residing in a Utah nursing home? 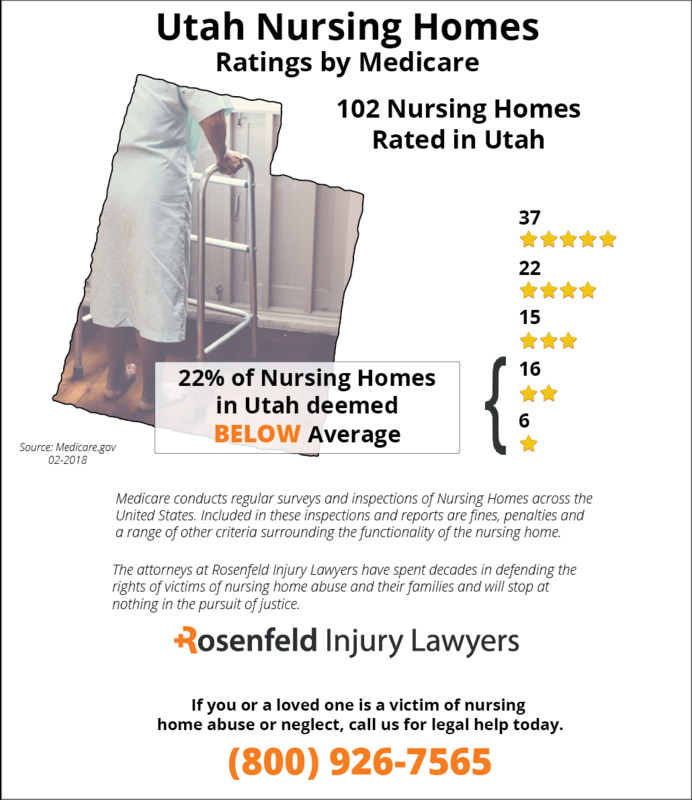 If so, we invite you to contact the Utah nursing home abuse & neglect attorneys at Nursing Home Law Center today to discuss a case for compensation. We offer every potential client a free case review. In Utah, over one-third of all nursing homes have deficiencies in the professional standards, food sanitation and in maintaining a safe environment for nursing home residents. In 2008, researchers from the University of California-San Francisco found that over 21 percent of all nursing homes provided unnecessary drugs to patients. Unnecessary drugs can be referred to as “chemical restraints,” and they are used as a way to control the behavior of residents. It is illegal to administer drugs to nursing home residents as a way to sedate their behavior or try to control their movements. If you discover that your loved one has been forced to consume chemical restraints, then you should get in touch with Utah nursing home abuse lawyers today. 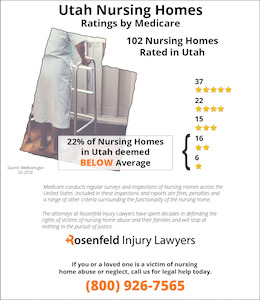 Utah nursing home abuse lawyers are available to investigate your loved one’s case and protect him or her. In Utah, there are nursing home injury laws in place to protect the rights of residents. Family members have a total of four years to file a nursing home negligence case within the time of first discovering an injury on a loved one. For a medical malpractice case, the time period is for two to four years. Family members may only obtain non-economic damages in medical malpractice actions for up to $400,000. For a wrongful death case, family members only have a limited time of two years in which to file a claim. 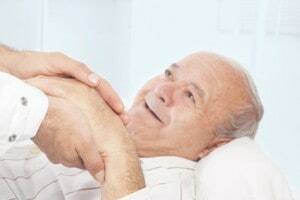 This means that if your loved one has died from abuse or neglect, then you should speak to nursing home injury lawyers as soon as possible to file your claim. One can only receive up to $400,000 for non-economic damages in medical malpractice claims. The two statutes that are in place to protect the legal rights of residents are the Adult Protective Services Act and the Abuse, Neglect or Exploitation of a Vulnerable Adult Act. For individuals who have engaged in the abuse of a vulnerable adult, there may be a felony charge if the abuse has been intentional. If a vulnerable adult was exploited in a negligent or reckless manner, then a worker may be guilty of a misdemeanor charge. If you are unsure of whether a loved one qualifies for compensation, then you should get in touch with a nursing home injury lawyer today. 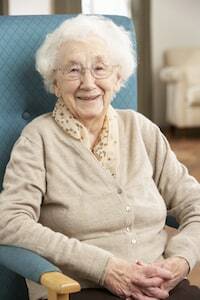 Nursing home injury lawyers are available to provide an assessment of your case. You may be eligible to file a negligence claim, or a nursing home lawyer may be able to settle your claim outside of court. Nearly every type of issue involved with a developing pressure sore (bedsore; pressure ulcer; decubitus ulcer) can be prevented when the medical team at a nursing home performs a routine inspection on the patient’s skin. By inspecting body parts, especially bony prominences, any potential developing bedsore can be easily recognized while in the early stage. The most common places for a bedsore to develop on the body include bony areas such as the shoulders and shoulder blades, head, heels, ankles, buttocks, sacrum, hipbones and spine. Stage I – In its initial stage, a pressure sore will appear on the body as a reddened area with or without blisters and red dots. The complete healing process can begin by alleviating the pressure, and keeping it off the area until the wound is resolved. Stage II – When the medical team allows an early-stage bedsore to advance to the next level, a shallow crater appears on the skin surface at the affected area. Fatty deposits may also be present. Effective treatment requires specialized wound dressings to decrease the potential of infection. Stage III – At this stage, the pressure sore begins to ulcerate significantly, causing a deep crater at the site. Infection is likely unless intervention is taken, including the use of prescribed antibiotics. Stage IV – If the antibiotics are ineffective or not prescribed, the bedsore can easily advance to a crucial life-threatening decubitus ulcer where the patient’s health is greatly compromised. Healing at this stage, if possible, usually requires outside medical intervention by teams of specialists competently trained in treating life-threatening bedsores. In many incidences, patients with advanced stage pressure ulcers die from sepsis (blood infection) or osteomyelitis (bone infection). Medical science has long established the proven protocols necessary to minimize the potential of an initial bedsore progressing to an advanced stage. Because of that, nearly every Stage II to Stage IV is an indicator of neglect at the nursing facility. Had the staff followed protocol by routinely monitoring the patient’s skin every day, ensuring that their body is readjusted every two hours or less, the advancement of the bedsore could likely have been prevented. Because of that, many families will hire a Utah pressure sore lawyer to stop the negligence immediately. If you and your family suspect that negligence by the nursing staff has caused your love one to suffer a bedsore, it is essential to speak with a Utah pressure sore lawyer. Fill out the form here to schedule an appointment with one of the reputable law firms listed below. To avoid the need for any upfront fees, your attorney will take your case on contingency. The law firm can file a claim or lawsuit demanding financial recompense for the injuries and damages your loved one has endured.